Heat networks have the potential to supply cost effective low carbon heat to households and businesses. The UK Government has pledged £320m of capital support to heat network investment in the UK. How much of this funding should be diverted to improve existing networks? Phase I climaxed in the “Low Carbon Heat Networks – How to optimise an existing system for improving performance” Report. This identifies post-implementation measures that various stakeholders can implement if they have an underperforming heat network across technical, contractual and behaviour areas. The report received positive feedback from industry and a CBx Roundtable resulted in furthering the discussion on existing networks and need to influence policy, creating Phase II. 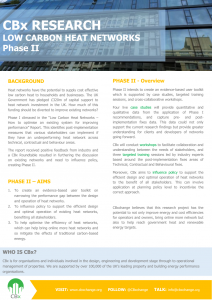 Please click to download an overview of CBx Research on Low Carbon Research - Phase II. Phase II intends to create an evidence-based user toolkit which is supported by case studies, targeted training sessions, and cross-collaborative workshops. Four live case studies will provide quantitative and qualitative data from the application of Phase I recommendations, and capture pre- and post- implementation fixes data. This data could not only support the current research findings but provide greater understanding for clients and developers of networks going forward. CBx will conduct workshops to facilitate collaboration and understanding between the needs of stakeholders, and three targeted training sessions led by industry experts based around the post-implementation fixes areas of Technical, Contractual and Behavioural fixes. Moreover, CBx aims to influence policy to support the efficient design and optimal operation of heat networks to the benefit of all stakeholders. This can involve application at planning policy level to incentivise the correct approach. CBxchange believes that this research project has the potential to not only improve energy and cost efficiencies for operators and owners, bring online more network but also to help reach government heat and renewable energy targets. To create an evidence-based user toolkit on narrowing the performance gap between the design and operation of heat networks. To influence policy to support the efficient design and optimal operation of existing heat networks, benefiting all stakeholders. To help optimise the efficiency of heat networks, which can help bring online more heat networks and so mitigate the effects of traditional carbon-based energy. To develop case studies implementing Phase I recommendations aimed at improving heat network performance. To collect pre- and post- quantitative and qualitative data from district and communal heat network case studies. To provide tailored training sessions based on the three core recommendations of Technical, Contractual and Behavioural fixes. The heat network research will kick off April 2017 and will run for 12 months. Members will attend a kick off meeting and then one meeting every quarter to discuss progress. Meetings with individuals will be necessary to talk specifically about data and to perform an assessment on heat networks. Do you have an existing network you wish to optimise; expertise in technical, contractual, or behavioural areas; or wish to know more information, please contact CBx Programme Manager, Emma Bleach at emma@cbxchange.org or call on 01344 388 014.